Cattle with “Lineback” color patterns have occurred throughout the world in many breeds. In the Texas Longhorn and some African breeds, the Lineback patterns occur randomly. In breeds such as the English Longhorn, Gloucester, Pinzgauer, Vosgienne, and the Moiled cattle of Ireland, the Lineback pattern in some form is their identifying characteristic. And still others, such as the native Welsh breed, consistently display several “color phases“, of which the “Lineback” is one. Geneticists recognize two variations of the Lineback Cattle. The first, is known as Gloucester, in which the animal has a dark, usually black or red body with a white dorsal stripe, possibly a star on the face, white tail and belly, and perhaps one or more garters or white bands around the legs, where they join the body. The other, known as Witrick separates into 3 major types of “Witrick’s” the White classic Witrick, Dark-Sided Witrick, and Dark Specked Witrick. The White Classic Witrick is more prevalent type and has a lot more white on the body and face, followed with black or red eyes, nose and ears, but Witrick’s of all patterns can be found with much “speckling or brockling” on the face, body, and legs. The brockling may be in the form of round or elliptical spots or roaning or both. Of the variations found, the Witrick variety predominating over the Gloucester. The English Longhorn, Irish Moiled, Norwegian Telemark, Swedish Mountain, and Dutch Witrick have the Witrick as their characteristic marking, while the Gloucester pattern in which brockling does not occur is exemplified by the English Old Gloucester and the Austrian Pinzgauer. It is reasonable to assume that Linebacks were among the cattle imported into the U.S. in the 17th and 18th centuries. The Dutch were bringing cattle into New York at a time when the Witrick was plentiful, while many British ships coming to America were sailing from Bristol, a geographically convenient port for the export of Gloucester and Welsh cattle. Considering that livestock of all classes has been imported to the United States, it is not surprising that we have our own “Lineback breed”. During the 19th century progressive American farmers began to look again to Europe for improved stock, including Ayrshires, Friesians, Herefords and Milking Shorthorns, all of which were capable of throwing occasional linebacked offspring. There breeds, plus the English Longhorn, probably contributed to the Lineback presence in the United States. Following World War II, in the stampede for bigger yields, dairy farmers increasingly began to use Holstein bulls to “upgrade” their herds. In New England these herds were often the old unimproved Durhams or Milking Shorthorns, but in New York and the Midwest, as well as much of northern Vermont and neighboring Canada, there were many herds of Linebacks of both types which were graded up with Holstein bulls. 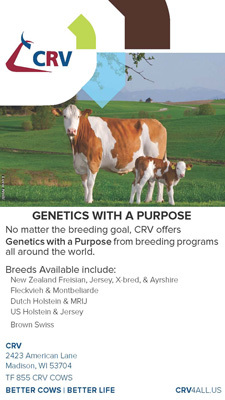 Because the Lineback patterns are genetically strong and the Holstein pattern is weak, the Lineback will often persist through many generations of outcrossing. The sources from which our stock derive and the periods when their ancestors entered our agricultural history are conjectural and likely not be resolved fully, as documentation is almost nonexistent. Today there are several thousand Lineback dairy cows in the United States, some of them essentially Holsteins, some from Milking Shorthorn or other backgrounds, and some quite unique! Originating mainly from Holland, Europe in the 1700-1800’s, Lineback’s first appeared in America when English and Hollanders settled in the country. Lineback’s were a very dual-purpose animal, fulfilling the owners’ needs for both milk and meat. As time went on into the 1900’s, farmers started to specialize in either beef or dairy production. 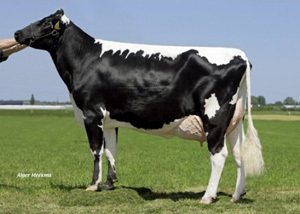 The Lineback has over time been selected for improved dairy production due to there “high components“, although it remains a very versatile breed, that was and is heavily influenced by Holstein Blood. The “Lineback cow” has been up-bred to be a very productive dairy cow. Still occasionally influenced by Holstein blood this genetically superior breed has remained versatile enough to be prevalent in these demanding modern times. Today there are several thousand Lineback cows in the United States. The use of the word “Lineback” refers to both appearance and breed. The common factor of all the patters is the white line across the back, the dark solid color of the ears and nose, outlining of the eyes and one or more dark hooves. “Red and white” or “Black and white” are the predominant “color” patterns. The Composite Dairy Cattle Registry processes the registrations for the American Lineback Cattle Registry.